For rivers named Luohe, see Luo River (disambiguation). 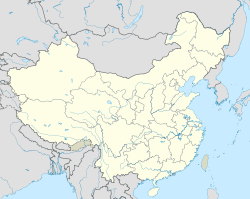 Luohe (Chinese: 漯河; pinyin: Luòhé; postal: Loho) is a prefecture-level city in central Henan province, China. It is surrounded by the cities of Xuchang, Zhoukou, Zhumadian and Pingdingshan on its north, east, south and west respectively. Its population was 2,544,266 inhabitants at the 2010 census whom 1,294,974 lived in the built-up (or metro) area made up of Yancheng, Shaoling and Yuanhui districts. The prefecture level city of Luohe administers 3 districts and 2 counties. Cultivation of wheat, corn and textile industry are important for the economy of the area. The city is famous for its ham production industry. Shuanghui is the biggest meat processing company in the world, after purchasing the American meat company, Smithfield. A commercial center since ancient times, Luohe presently is home to light industries including food preparation, paper, leather making / shoes, textiles, cigarettes, and electronics. Xu Shen (许慎): famous scholar during the Han Dynasty. He compiled the first Chinese character dictionary Shuowen Jiezi. ^ "China: Hénán (Prefectures, Cities, Districts and Counties) - Population Statistics, Charts and Map". www.citypopulation.de. Retrieved 17 April 2018. This page was last edited on 30 June 2018, at 04:43 (UTC).